The semiconductor equipment manufacturer's share price has taken a hit due to a weakened outlook for its core segment. 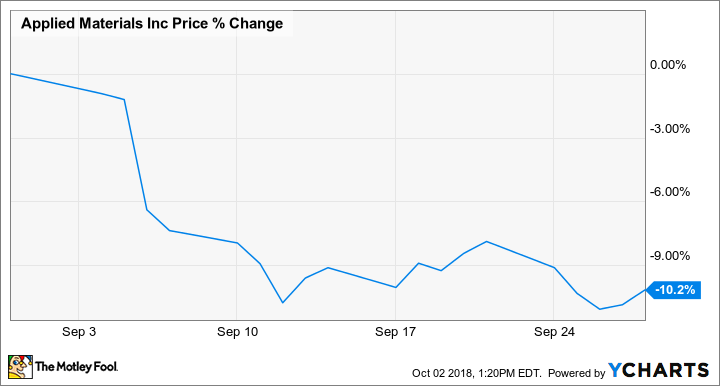 Comments from Micron Technology's chief financial officer indicating continued declines for NAND memory prices and a bearish note on the outlook for the memory-chip industry from Morgan Stanley analyst Shawn Kim resulted in steep sell-offs for Applied Materials and other related semiconductor companies on Sept. 6. The iShares Philadelphia Semiconductor ETF closed the month down 2.8%. Applied Materials' semiconductor systems segment accounted for 61% of the company's sales in its July quarter, and combined flash and DRAM memory business accounted for 60% of that revenue. The company has benefited from strong demand for memory chips over the last several years, with its earnings and stock price hitting record highs earlier this year; a downturn for the memory chip market is likely to have a significant, negative impact on performance. 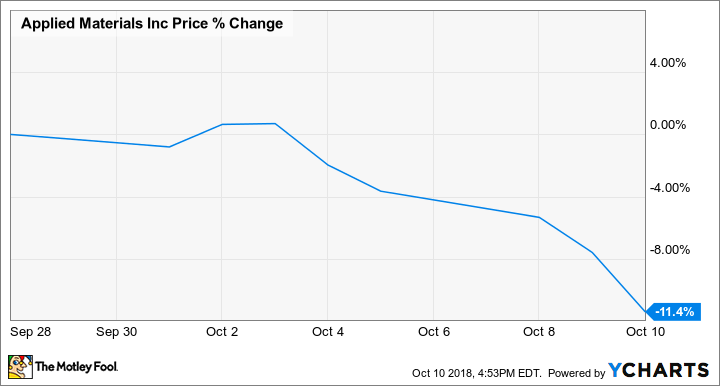 Applied Materials' stock has continued to lose ground in October, with continued impact from the market's bearish shift on memory chips and combining with broader market sell-offs to push shares down roughly 11.4% in the month as of this writing. The stock now trades at roughly 7.5 times this year's expected earnings, but the company's profits have historically been tied to cyclical swings in the memory chip and data storage markets -- so investors shouldn't rely on that seemingly low multiple as an indication that the stock is near a bottom. Applied Materials is expected to report third-quarter earnings in mid-November and is guiding for earnings per share of $0.96 on sales of $4 billion -- targets that underwhelmed the market and led to double-digit sell-offs in August.